Documenting a marriage proposal, the moment ‘he pops the question’, is becoming more popular. And if you’ve ever proposed to your loved one, or been proposed to, you know it’s not easy planning a surprise proposal, let alone an elaborate one that involves a masseuse, a caterer and a photographer, all without the girlfriend finding out and only with the use of the Internet and Google Maps. But Jason did it, and he he did it all from Spain. Having met Maria while travelling and working in Spain, Jason brought her back to Australia recently to show her around his home country. What Maria didn’t know was that Jason had coordinated with multiple vendors to create a beautiful proposal, involving a bottle of wine with a personalised message, a cosy little cottage lit up by candles and lanterns and rose petals, a delectable dinner cooked by Cameron, the man of Port Douglas Catering and Events himself… And I was there (hiding behind the trees!) 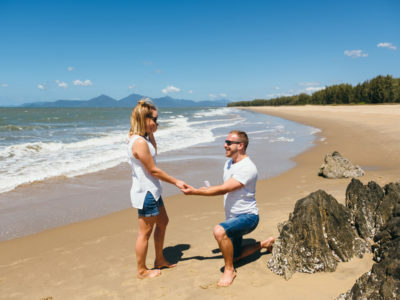 to capture Maria’s reaction when he got down on one knee at the little secluded beach by the Sugar Wharf in Port Douglas.